Schick managed to squeeze in a few of those precious moments for reporters to follow up with him on the company’s direction in social and collaboration business, an operation that he’s been part of since 2006, including as the creator of the IBM Connections enterprise social platform. We have a very large on-premises business and a very fast growing cloud-based business. At this stage we have symmetry between the offerings: We have a mail offering on prem [currently Notes, but IBM Verse is headed there too], we have it in the cloud; we have a social network for work on premises, we also have that in the cloud. In the 2014 timeframe we really focused ourselves from a development point of view on cloud first and continuous development and delivery. We have the opportunity then to make snapshots of those technologies and build them out as on-premises releases. Whereas in the cloud we will make updates every single week, on premises we’re good for probably a major release every year for each of the respective on-premises technologies that are part of the collaboration portfolio. Those organizations that are interested in cloud and think it is a viable option for their company, then they’re thinking of that in terms of mail, office productivity, social networking, meetings, chat. They’re thinking about that holistically. Most people are not securing meeting services on premises any longer. It’s almost gone fully towards a cloud-based model. Mail is growing more so. Social networking, look, it started with some of the larger consumer-based providers…. From our vantage point at least for a long period of time there will be an on-premises because because of governance and compliance. That’s not to say we haven’t solved many of those challenges in the cloud, but their belief system and position is based upon their sensibilities. We have built and integrated compliance technologies in the cloud so that if a bank wanted to move their mail to the cloud, the regulatory stewardship that they have over that content is absolutely possible through archiving e-discovery capabilities that are available. We’ve bought two major video providers, one focused on streaming, another providing that as an on-demand capable service [and IBM has created a cloud video unit]. Right now in the unified communications space you have a diversity of video: You have one-on-one video, one-on-many video [that can behave like a group chat], a meeting that’s exploiting video to see people as you’re sharing a presentation, and then in some cases that presentation sharing could be spawned in lecture mode, and then you have live streaming. The part of IBM that made the [video acquisitions] wasn’t necessarily the collaboration business, but I like it, I’m going to exploit it, I’m going to add it to offerings so that your social network can have streaming video as part of it. I really see that also happening as a statement of when you look at [IBM’s SoftLayer cloud platform] and the SoftLayer set of services you start to look at here are things that I can do through SoftLayer APIs to administer, manage...even in commerce, file management, video services. That’s not unlike some of the moves you’re seeing made by Amazon in terms of the services they are making inherently as part of their cloud-based offering. Facebook has WhatsApp [which actually runs in SoftLayer] and then there’s Slack. These are tools that have emerged almost like text messaging apps that are focused on the conversation. We think there’s a couple problems with that. One, people that we know that have been using Slack for any appreciable period of time feel like their information organization is totally kaput, like "Where did that conversation take place?" If you put artifacts in it "How do I get back to it?" People are struggling with just the basic utility of "I’m having a conversation and how do I get back to the information, artifacts, content, decisions that were made when they still sit within the conversation framework?" We’ve solved that by if you put a file into the conversation we'll still store it within your content store where you would expect all the rest of your content to be. So how some of these technologies are integrating the broader collaboration set is problematic. Somebody doesn’t need to just have a conversation, or just doesn’t need to create or share content. We need to do all of that, and that’s where we’re coming from with Toscana. 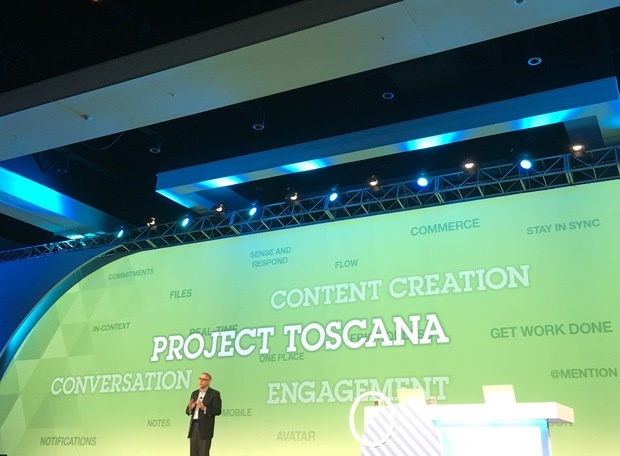 The Toscana conversation engine itself is a capability not related to unified communication or your social network or your email. We’ve built a conversation engine. We didn’t just go and say, let’s take our Sametime chat engine and put a new user experience on it, because a chat engine doesn’t have the same characteristics as a conversation engine [that includes presence, content sharing and other capabilities]. Watson represents a fairly substantial brand now across a diverse set of products. We have as early as the beginning of last year integrated corpuses of knowledge that were encoded within Watson and plugged them into an activity stream, [into mail] or where a discussion was taking place. It’s all off the shelf for us now. The request-reply paradigm is now in place to support information transfer and questions. We’re making it easier and easier to do that. Today we showed the "tone analyzer" [for giving a sender a heads up about the sentiment of a message being crafted]. Watson is actually quite a few different things in cognitive, but in principal you’re doing work that previously only a person did. Any customer that is leveraging our cloud mail service has the opportunity to use Verse and we have a very large cloud mail service.